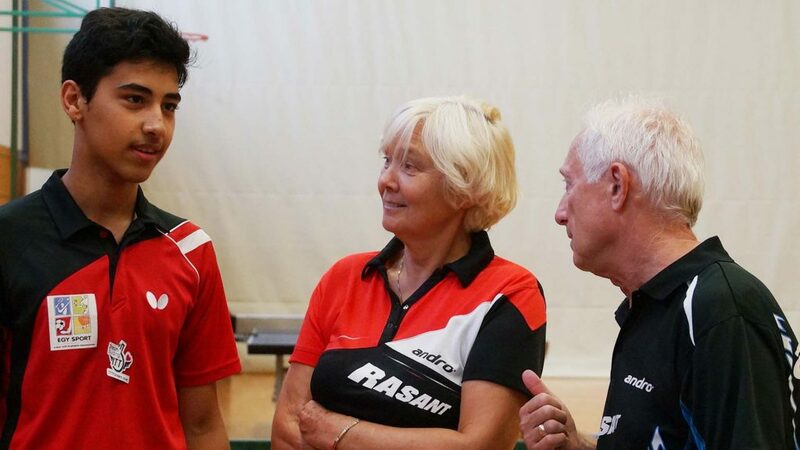 Winner on the ITTF World Junior Circuit on home soil in Cairo in March, Egypt’s Youssef Abdel-Aziz was named earlier this year as the ITTF Dream Building Ambassador. Furthermore, it is a busy time for the 16 year old who, having played in such events as the 2014 ITTF World Cadet Challenge in the Caribbean island of Barbados is now a seasoned competitor. Undoubtedly, he has the realistic possibility of an invitation to attend the 2016 ITTF World Junior Circuit Finals to be staged in the Indian city of Indore next January. Currently he is the leading name on the Boys’ Standings from Egypt and he has met the necessary two continent criteria; thus with Indore and other international events in mind, intense training is very much the order of the day. Recently from Sunday 3rd to Tuesday 26th July, he attended the Werner Schlager Academy in Austria; presently he is in Heidelberg. In the German city, he will conclude a week-long stint on Friday 9th September before returning in one month’s time. He plans to be in Heidelberg from Monday 3rd to Friday 7th October. Looking ahead but time travels fast; was it really over two years ago since we were in Nanjing? Safir is the overall title for the well-established tournament in Örebro of which the Swedish Junior and Cadet Open is a constituent part. Learning and improving but although Indore is undoubtedly a goal, Buenos Aires is an even bigger goal. Moreover, Youssef Abdel-Aziz is positive. “With one player per country my chances to qualify high are real and in 2018 I will be in my prime junior days”, concluded Youssef Abdel-Aziz. Ambitious and most certainly the Egyptian teenager has impressed Peter Gardos, who is the father of well-known Austrian international, Robert Gardos and Krisztian Gardos; the latter will be on duty at the forthcoming Paralympic Games in Rio de Janeiro. Peter Gardos is coach of considerable experience, over 40 years in the role, having been the mentor for the celebrated BVSC Club in his native Hungary. A lifestyle and Peter Gardos has views on lifestyle. Perhaps those thoughts can be transmitted to Youssef Abdel-Aziz? An astute assessment and, just as Youssef Abdel-Aziz is clear about his goals, Peter Gardos is clear about the areas needed for improvement. Everything at hand but of course Yousse fAbdel-Aziz is somewhat alone. “Here in Heidelberg, the programme is different; he is the only Egyptian player and it is not so easy for him”, continued Peter Gardos. “I is good opportunity to change some habits but it is also has its dangers because certain mental strength is needed. A very good report from Peter Gardos; it is the same from Eva Jeler, the head coach in Heidelberg. It is a very professional organisation but demanding. A great deal required but from Youssef Abdel-Aziz there is a most positive response; the ambassador can dream of a bright future.